First Line:"There was a demon in McDonald's." JLA has done it again another awesome start to a new series about demons and gargoyles with two completely swoon worthy guys although I am totally pining over Roth right now. If you know me you know I don't like love triangles or any of that but there are some authors who can pull it off and JLA is one of those authors I mean I'm sitting here craving to get my hands on the second book already. If you want to talk about a book that has the right dose of chemistry, sexual tension and all that jazz between the main characters then this was it right here, I mean I loved every single second between Roth and Layla they were sizzling hot together and I loved how Layla was able to be more of herself around Roth and how Roth cared for her because of her and not having her deny any part of who she is. There was also Zayne and before Roth came along I was all for Zayne. Zayne and Layla have been friends since kids but obviously they can't be together since if Layla even kisses Zayne she will end up taking his soul so yea there are complications and neither one ever oversteps the friend zone. Right now i'm all for Roth he saved her life and I mean the sacrifice he made for her at the end...yeah I have a new book boyfriend right now. Although this might be a series I'll be finding myself going back and forth between the guys until the very end. What surprised me quite a bit was how emotionally invested I became with Layla's character, there is a lot of unfairness in her life and I really found myself rooting for her. If I had to nitpick the one issue that I had through about majority of the book was I wanted Lalya to stand up for herself from the get go the Wardens pretty much controlled her calling her naive and treating her like a child and not acknowledging her demon side which made her hate her demon side as well so there was a lot of inner turmoil in Layla's character. 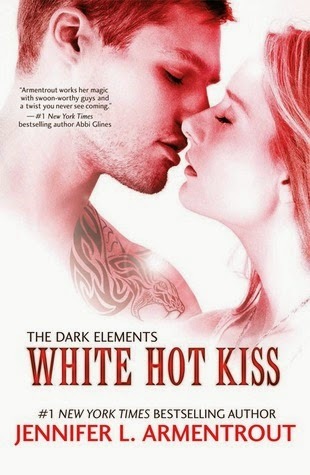 Overall there is tons of action between demons trying to kill Layla and the Wardens (gargoyles) going against the demons and then the in-house betrayals also so between that and fiery romance brewing between the characters topped off with great world building I didn't have one dull moment while reading White Hot Kiss the book was a complete page turner.